Not to be confused with transcription termination factor, RNA polymerase I or TTF1. 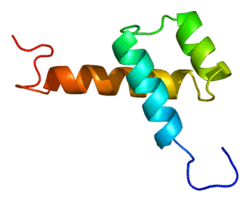 Thyroid transcription factor-1 (TTF-1) is a protein that regulates transcription of genes specific for the thyroid, lung, and diencephalon. It is also known as thyroid specific enhancer binding protein. It is used in anatomic pathology as a marker to determine if a tumor arises from the lung or thyroid. NKX2.1 can be induced by activin A via SMAD2 signaling in a human embryonic stem cell differentiation model. Micrograph of a metastatic lung adenocarcinoma (found in the brain) that exhibits nuclear staining (brown) for TTF-1. TTF-1 positive cells are found in the lung as type II pneumocytes and club cells. In the thyroid, follicular and parafollicular cells are also positive for TTF-1. For lung cancers, adenocarcinomas are usually positive, while squamous cell carcinomas and large cell carcinomas are rarely positive. Small cell carcinomas (of any primary site) are usually positive. TTF1 is more than merely a clinical marker of lung adenocarcinoma. It plays an active role in sustaining lung cancer cells in view of the experimental observation that it is mutated in lung cancer. However others have found that TTF-1 staining is often positive in pulmonary adenocarcinomas, large cell carcinomas, small-cell lung carcinomas, neuroendocrine tumors other than small-cell lung carcinomas and extrapulmonary small-cell carcinomas. It is also positive in thyroid cancers and is used for monitoring for metastasis and recurrence. NK2 homeobox 1 has been shown to interact with Calreticulin and PAX8. ↑ Guazzi S, Price M, De Felice M, Damante G, Mattei MG, Di Lauro R (Nov 1990). "Thyroid nuclear factor 1 (TTF-1) contains a homeodomain and displays a novel DNA binding specificity". The EMBO Journal. 9 (11): 3631–9. PMC 552115 . PMID 1976511. ↑ Li Y, Eggermont K, Vanslembrouck V, Verfaillie CM (May 2013). "NKX2-1 activation by SMAD2 signaling after definitive endoderm differentiation in human embryonic stem cell". Stem Cells and Development. 22 (9): 1433–42. doi:10.1089/scd.2012.0620. PMID 23259454. ↑ Kendall J, Liu Q, Bakleh A, Krasnitz A, Nguyen KC, Lakshmi B, Gerald WL, Powers S, Mu D (Oct 2007). "Oncogenic cooperation and coamplification of developmental transcription factor genes in lung cancer". Proceedings of the National Academy of Sciences of the United States of America. 104 (42): 16663–8. doi:10.1073/pnas.0708286104. PMC 2034240 . PMID 17925434. ↑ Tanaka H, Yanagisawa K, Shinjo K, Taguchi A, Maeno K, Tomida S, Shimada Y, Osada H, Kosaka T, Matsubara H, Mitsudomi T, Sekido Y, Tanimoto M, Yatabe Y, Takahashi T (Jul 2007). "Lineage-specific dependency of lung adenocarcinomas on the lung development regulator TTF-1". Cancer Research. 67 (13): 6007–11. doi:10.1158/0008-5472.CAN-06-4774. PMID 17616654. ↑ Weir BA, Woo MS, Getz G, Perner S, Ding L, Beroukhim R, Lin WM, Province MA, Kraja A, Johnson LA, Shah K, Sato M, Thomas RK, Barletta JA, Borecki IB, Broderick S, Chang AC, Chiang DY, Chirieac LR, Cho J, Fujii Y, Gazdar AF, Giordano T, Greulich H, Hanna M, Johnson BE, Kris MG, Lash A, Lin L, Lindeman N, Mardis ER, McPherson JD, Minna JD, Morgan MB, Nadel M, Orringer MB, Osborne JR, Ozenberger B, Ramos AH, Robinson J, Roth JA, Rusch V, Sasaki H, Shepherd F, Sougnez C, Spitz MR, Tsao MS, Twomey D, Verhaak RG, Weinstock GM, Wheeler DA, Winckler W, Yoshizawa A, Yu S, Zakowski MF, Zhang Q, Beer DG, Wistuba II, Watson MA, Garraway LA, Ladanyi M, Travis WD, Pao W, Rubin MA, Gabriel SB, Gibbs RA, Varmus HE, Wilson RK, Lander ES, Meyerson M (Dec 2007). "Characterizing the cancer genome in lung adenocarcinoma". Nature. 450 (7171): 893–8. doi:10.1038/nature06358. PMC 2538683 . PMID 17982442. ↑ Kwei KA, Kim YH, Girard L, Kao J, Pacyna-Gengelbach M, Salari K, Lee J, Choi YL, Sato M, Wang P, Hernandez-Boussard T, Gazdar AF, Petersen I, Minna JD, Pollack JR (Jun 2008). "Genomic profiling identifies TITF1 as a lineage-specific oncogene amplified in lung cancer". Oncogene. 27 (25): 3635–40. doi:10.1038/sj.onc.1211012. PMC 2903002 . PMID 18212743. ↑ Kalhor N, Zander DS, Liu J (Aug 2006). "TTF-1 and p63 for distinguishing pulmonary small-cell carcinoma from poorly differentiated squamous cell carcinoma in previously pap-stained cytologic material". Modern Pathology. 19 (8): 1117–23. doi:10.1038/modpathol.3800629. PMID 16680154. ↑ Espinoza CR, Schmitt TL, Loos U (Aug 2001). "Thyroid transcription factor 1 and Pax8 synergistically activate the promoter of the human thyroglobulin gene". Journal of Molecular Endocrinology. 27 (1): 59–67. doi:10.1677/jme.0.0270059. PMID 11463576. ↑ Perrone L, Tell G, Di Lauro R (Feb 1999). "Calreticulin enhances the transcriptional activity of thyroid transcription factor-1 by binding to its homeodomain". The Journal of Biological Chemistry. 274 (8): 4640–5. doi:10.1074/jbc.274.8.4640. PMID 9988700. ↑ Di Palma T, Nitsch R, Mascia A, Nitsch L, Di Lauro R, Zannini M (Jan 2003). "The paired domain-containing factor Pax8 and the homeodomain-containing factor TTF-1 directly interact and synergistically activate transcription". The Journal of Biological Chemistry. 278 (5): 3395–402. doi:10.1074/jbc.M205977200. PMID 12441357. Lau SK, Luthringer DJ, Eisen RN (Jun 2002). "Thyroid transcription factor-1: a review". Applied Immunohistochemistry & Molecular Morphology. 10 (2): 97–102. doi:10.1097/00022744-200206000-00001. PMID 12051643. Guazzi S, Price M, De Felice M, Damante G, Mattei MG, Di Lauro R (Nov 1990). "Thyroid nuclear factor 1 (TTF-1) contains a homeodomain and displays a novel DNA binding specificity". The EMBO Journal. 9 (11): 3631–9. PMC 552115 . PMID 1976511. Oguchi H, Pan YT, Kimura S (Apr 1995). "The complete nucleotide sequence of the mouse thyroid-specific enhancer-binding protein (T/EBP) gene: extensive identity of the deduced amino acid sequence with the human protein". Biochimica et Biophysica Acta. 1261 (2): 304–6. doi:10.1016/0167-4781(95)00033-D. PMID 7711079. Saiardi A, Tassi V, De Filippis V, Civitareale D (Apr 1995). "Cloning and sequence analysis of human thyroid transcription factor 1". Biochimica et Biophysica Acta. 1261 (2): 307–10. doi:10.1016/0167-4781(95)00034-E. PMID 7711080. Ikeda K, Clark JC, Shaw-White JR, Stahlman MT, Boutell CJ, Whitsett JA (Apr 1995). "Gene structure and expression of human thyroid transcription factor-1 in respiratory epithelial cells". The Journal of Biological Chemistry. 270 (14): 8108–14. doi:10.1074/jbc.270.44.26460. PMID 7713914. Ghaffari M, Zeng X, Whitsett JA, Yan C (Dec 1997). "Nuclear localization domain of thyroid transcription factor-1 in respiratory epithelial cells". The Biochemical Journal. 328 ( Pt 3) (3): 757–61. PMC 1218983 . PMID 9396717. Hamdan H, Liu H, Li C, Jones C, Lee M, deLemos R, Minoo P (Mar 1998). "Structure of the human Nkx2.1 gene". Biochimica et Biophysica Acta. 1396 (3): 336–48. doi:10.1016/S0167-4781(97)00210-8. PMID 9545595. Perrone L, Tell G, Di Lauro R (Feb 1999). "Calreticulin enhances the transcriptional activity of thyroid transcription factor-1 by binding to its homeodomain". The Journal of Biological Chemistry. 274 (8): 4640–5. doi:10.1074/jbc.274.8.4640. PMID 9988700. Naltner A, Ghaffari M, Whitsett JA, Yan C (Jan 2000). "Retinoic acid stimulation of the human surfactant protein B promoter is thyroid transcription factor 1 site-dependent". The Journal of Biological Chemistry. 275 (1): 56–62. doi:10.1074/jbc.275.1.56. PMID 10617585. Missero C, Pirro MT, Di Lauro R (Apr 2000). "Multiple ras downstream pathways mediate functional repression of the homeobox gene product TTF-1". Molecular and Cellular Biology. 20 (8): 2783–93. doi:10.1128/MCB.20.8.2783-2793.2000. PMC 85494 . PMID 10733581. Naltner A, Wert S, Whitsett JA, Yan C (Dec 2000). "Temporal/spatial expression of nuclear receptor coactivators in the mouse lung". American Journal of Physiology. Lung Cellular and Molecular Physiology. 279 (6): L1066–74. PMID 11076796. Yan C, Naltner A, Conkright J, Ghaffari M (Jun 2001). "Protein-protein interaction of retinoic acid receptor alpha and thyroid transcription factor-1 in respiratory epithelial cells". The Journal of Biological Chemistry. 276 (24): 21686–91. doi:10.1074/jbc.M011378200. PMID 11274148. Missero C, Pirro MT, Simeone S, Pischetola M, Di Lauro R (Sep 2001). "The DNA glycosylase T:G mismatch-specific thymine DNA glycosylase represses thyroid transcription factor-1-activated transcription". The Journal of Biological Chemistry. 276 (36): 33569–75. doi:10.1074/jbc.M104963200. PMID 11438542. Yi M, Tong GX, Murry B, Mendelson CR (Jan 2002). "Role of CBP/p300 and SRC-1 in transcriptional regulation of the pulmonary surfactant protein-A (SP-A) gene by thyroid transcription factor-1 (TTF-1)". The Journal of Biological Chemistry. 277 (4): 2997–3005. doi:10.1074/jbc.M109793200. PMID 11713256. Liu C, Glasser SW, Wan H, Whitsett JA (Feb 2002). "GATA-6 and thyroid transcription factor-1 directly interact and regulate surfactant protein-C gene expression". The Journal of Biological Chemistry. 277 (6): 4519–25. doi:10.1074/jbc.M107585200. PMID 11733512. Ng WK, Chow JC, Ng PK (Feb 2002). "Thyroid transcription factor-1 is highly sensitive and specific in differentiating metastatic pulmonary from extrapulmonary adenocarcinoma in effusion fluid cytology specimens". Cancer. 96 (1): 43–8. doi:10.1002/cncr.10310. PMID 11836702. Pohlenz J, Dumitrescu A, Zundel D, Martiné U, Schönberger W, Koo E, Weiss RE, Cohen RN, Kimura S, Refetoff S (Feb 2002). "Partial deficiency of thyroid transcription factor 1 produces predominantly neurological defects in humans and mice". The Journal of Clinical Investigation. 109 (4): 469–73. doi:10.1172/JCI14192. PMC 150877 . PMID 11854318. Krude H, Schütz B, Biebermann H, von Moers A, Schnabel D, Neitzel H, Tönnies H, Weise D, Lafferty A, Schwarz S, DeFelice M, von Deimling A, van Landeghem F, DiLauro R, Grüters A (Feb 2002). "Choreoathetosis, hypothyroidism, and pulmonary alterations due to human NKX2-1 haploinsufficiency". The Journal of Clinical Investigation. 109 (4): 475–80. doi:10.1172/JCI14341. PMC 150790 . PMID 11854319. Miccadei S, De Leo R, Zammarchi E, Natali PG, Civitareale D (Apr 2002). "The synergistic activity of thyroid transcription factor 1 and Pax 8 relies on the promoter/enhancer interplay". Molecular Endocrinology. 16 (4): 837–46. doi:10.1210/me.16.4.837. PMID 11923479.